Don’t miss this great opportunity to get books at a very reasonable price while helping out your local library! We will go to the Jefferson County Fairgrounds and peruse many tables full of everything from non-fiction, to biographies, to cookbooks, reference books, movies, music and so much more! Bring your wallets and have a ball! If you cancel within 24 hours, you will be responsible for a $5 cancellation fee; $10 if it is a 2 van event. Sign up in the Birch dining room to be a part of this event. Rated NR….1947 Musical…Upon returning to his old Brooklyn neighborhood, ex-GI Danny (Frank Sinatra) moves in with his friend Nick (Jimmy Durante) and promptly falls for high school music teacher Anne (Kathryn Grayson). But Danny finds a rival for Anne’s affections in uptight Brit Jamie (Peter Lawford). This valentine to Flatbush features a swingin’ score by Jule Styne and Sammy Cahn. No need to sign up. Just come and enjoy! Don’t miss this wonderful morning at a scrumptious bakery in Highlands Ranch! The owners hail straight from France and bring incredible knowledge of the French pastry to their artistry! The menu includes egg scrambles, eggs benedicts, omelets, quiches, French toasts and much, much more! This is a great place to pick up special baked goods for family and friends! Please join us! Please peruse the menu in your building’s book prior to signing up! Breakfast is on your own. If you cancel within 24 hours of the event, you will be responsible for a $5 cancellation fee; $10 if it is a 2 van event. Please sign up in the Birch dining room to be a part of this event. Rated R….2017 Drama….In this fact-based drama, life-changes irrevocably for Jeff Bauman when a bomb goes off at his feet as he’s celebrating his completion of the 2013 Boston Marathon. Despite losing his legs, Bauman is determined to help find the culprits. Jake Gyllenhaal, Tatiana Maslany and Miranda Richardson lead this cast. No need to sign up, just come over and enjoy! The issue of race in the military extends from colonial times to the present day. Join Active Minds as we explore a chapter of this story from World War II: the Tuskegee Airmen. This group of African American pilots were the first black military aviators in the U.S. armed forces. We will tell their story of struggle and triumph and bring this issue into a current context. RSVP in your building’s book by Wednesday, June 6 to be a part of this event. Do you like good, clean humor? When was the last time you had a good, hearty belly laugh! Laughing is good for what ails you! We will ride the light rail down to the Convention Center and Bellco Theatre to enjoy a fun-filled evening of laughs! This is a pre-sign up event, if you missed signing up, please sign up on the waitlist in the Birch dining room! $67.50 will be charged to your account plus $2.35 for light rail round trip tickets. If you cancel and we cannot find a replacement, you will be responsible for $67.50 and $2.35. If you cancel within 24 hours of the event, you will also be responsible for a $5 cancellation fee; $10 if it is a 2 van event. Rated NR….1945 Musical….A four-day shore leave sends sailors Joe Brady (Gene Kelly) and Clarence Doolittle (Frank Sinatra) skirt-chasing in tinsel town, but before they even get started, they’re shanghaied into returning a young runaway to his aspiring chanteuse aunt (Kathryn Grayson). Next thing you know, Joe and Clarence are in love with the pretty songstress—and scrambling to keep their promise of getting her an audition with a celebrated musician. No need to sign up. Just come and enjoy! Have you recently been diagnosed with Macular Degeneration? Is seeing the newspaper getting harder and harder? Have you been considering giving up your car and driving? This support group is for you! Chris Kinney from the Colorado Center for the Blind will be facilitating this support group for all with vision concerns or issues! He will bring information about transportation, leisure activities and all that low sight issues entail. This will be a wonderful way to meet up with people of similar needs and be informed of available programs and products, etc… This group will meet once a month on the second Monday of each month at 3pm in the Cedar Theatre. This is a drop in, friendly group! Please come and join and be informed! No need to sign up, just come and gather information and be supportive of others dealing with similar issues! Join us for two spectacular IMAX movies: first, we will enjoy “America’s Musical Journey”- tap your toes across America as you experience the sounds of jazz, blues, zydeco, and old-time country music and see how they have shaped our nation’s distinctive musical heritage. In America’s Musical Journey, singer-songwriter Aloe Blacc takes you to vibrant places where American music was born, from New Orleans to New York City. Meet artists, music makers, and innovators who are shaping culture today with the creative risk-taking spirit that has always characterized America! Second, we will enjoy “Pandas” meet a very curious panda cub named Qian Qian, born at Chengdu Panda Base in China, as she prepares for life on her own in the mountains of Sichuan. Qian Qian’s journey to independence is steered by a team of international scientists, using a technique inspired by a rehabilitation program for black bear cubs in rural New Hampshire. The cross-cultural collaboration becomes a life-changing experience as together the team guides Qian Qian to take her first steps outside her protected habitat and discover her true animal nature, even as she faces the challenges of the unknown. Narrated by Kristen Bell. $14 will be charged for 2 IMAX movies! If you cancel and we cannot find a replacement, you will be responsible for $14. If you cancel within 24 hours of the event, you will also be responsible for a $5 cancellation fee; $10 if it is a 2 van event. Please sign up in the Birch dining room to be a part of this event. Rated PG-13…..2015 Drama….Six decades after World War II, Jewish octogenarian Maria Altmann (Helen Mirin) begins a quest to reclaim the artwork confiscated from her family by the Nazis—including a famed Gustav Klimt masterpiece..The Kiss. Helen Mirin, Ryan Reynolds, Max Irons, Tatiana Maslany and Katie Holmes lead this cast. No need to sign up, just come and enjoy! Don’t miss this lovely evening of wonderful friends, food and beautiful classical guitar. Kevin de Miranda, an area musician, will perform classical favorites on his acoustic guitar. Come join us for an evening of elegant guitar music that will warm your soul! RSVP in your buildling’s book by Tuesday, June 12 to be a part of this event. Let’s go enjoy one of the area’s restaurants. This restaurant offers fare from the deep south. The menu includes gumbo, etouffee, oysters, fried seafood plates, po’ boys, beignets and much more! What a great way to enjoy Cajun food! Please peruse the menu in your building’s book before you sign up. Lunch is on your own. If you cancel within 24 hours of the event, you will be responsible for a $5 cancellation fee; $10 if it is a 2-van event. Please sign up in the Birch dining room to be a part of this event. Rated NR….1949 Musical…Frank Sinatra, Gene Kelly, Jules Munshin and Ann Miller lead this timeless favorite! New York, New York, it’s a helluva town! Especially if you’re sailors on leave and ready for fun in this Oscar-winning musical comedy. They only have 24 hours in the Big Apple. The guys each find romance quickly, and they’re going to live every second to the hilt. Tunes include “Come up to My Place” and of course, “New York, New York.” No need to sign up, just come and enjoy! Don’t miss!!! The inimitable Thomas “Fats” Waller rose to international fame during the Golden Age of the Cotton Club and that jumpin’ new beat, swing music. Not quite a biography, the musical evokes the delightful humor and infectious energy of this American original. Ain’t Misbehavin’ is one of the most popular, well-crafted revues of all time winning the 1978 Tony Award for Best Musical. The intoxicating music of Fats Waller will delight and energize audiences providing great insight to a vibrant time in American history and music. The musical is a tribute to the black musicians of the 1920s and 1930s who were part of the Harlem Renaissance, an era of growing creativity, cultural awareness, and ethnic pride, and takes its title from the 1929 Waller song “Ain’t Misbehavin’”. It was a time when Manhattan nightclubs like the Cotton Club and the Savoy Ballroom were the playgrounds of high society and Lenox Avenue dives were filled with piano players banging out the new beat known as swing. Five performers present an evening of rowdy, raunchy, and humorous songs that encapsulate the various moods of the era and reflect Waller’s view of life as a journey meant for pleasure and play. $33 will be charged to your account for the ticket. There are limited tickets, so make sure you sign up! If you cancel and we cannot find a replacement, you will be responsible for $33. If you cancel within 24 hours of the event, you will also be responsible for a $5 cancellation fee; $10 if it is a 2 van event. Please sign up in the Birch dining room to be a part of this event. Travel with Chris and explore the wonders of several of our National Parks! Do you know how many National Parks are in the United States? How about Colorado? Have you visited any of them? Come along with Chris on a photographic journey, not only into many National Parks but also travel virtually on hiking trails, into forests, mountains, lake shores and other magnificent scenery. You will leave feeling inspired and filled with information about how you can personally enjoy your National Parks! RSVP to be a part of this event by Friday, June 15 in your building’s book. Rated PG-13….Historical Drama….Winston Churchill’s stirring defiance of the Nazi threat is the focus of this historical drama that depicts his fearless refusal to surrender Britain to Adolf Hitler and his relentless army during World War II’s early days. Gary Oldman, Kristin Scott Thomas and Ben Mendelsohn lead the cast of this Oscar-nominated film. No need to sign up, just come and enjoy! Join Cynthia Peer and view a beautiful slide show presentation and enjoy a little “fun in the sun” as you enjoy wonderful works of art from the era of Rococo with creators Watteau and Fragonard, up to the era of impressionism with two women of that era, Mary Cassat and Berthe Morisot. Learn the history behind these great artists and their beautiful, sunny works of art. RSVP to be a part of this event by Monday, June 18. 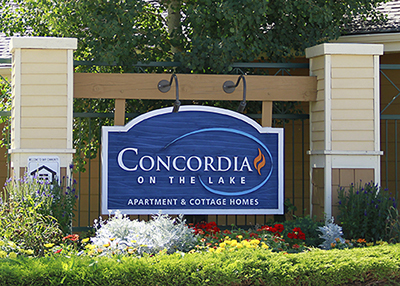 If you are a Cedar resident, please come to meet Mark Osweiler, Concordia’s General Manager! He will be in the Cedar common area to get to know each Cedar resident and answer any questions or concerns you may have. RSVP to be a part of this event by Tuesday, June 19. Get the girls together for a great day of shopping! Castle Rock Outlet Mall is the largest open-air outlet center in the State of Colorado, where you’ll find over 100 name-brand stores, including Coach, Polo Ralph Lauren, Tommy Hilfiger, American Eagle, Osh Kosh and so many more! Lunch is on your own. If you cancel within 24 hours of the event, you will be responsible for a $5 cancellation fee. Please sign up in the Birch dining room to be a part of this event. Rated…NR…1957 Musical….Using his charming wile and debonair dance moves, Joey Evans (Frank Sinatra), in a Golden-Globe-winning performance beguiles vixen widow Vera Simpson (Rita Hayworth) into financing his nightclub. He’s set up for success until good-natured chorus girl Linda English (Kim Novak) enters the picture and steals the show—and his heart. The Rogers and Hart musical features such memorable tunes as “I Could Write a Book” and “Bewitched, Bothered and Bewildered.” No need to sign up, just come and enjoy. Don’t miss this great opportunity to visit Green Mountain Falls Colorado (about 45 minutes west of Colorado Springs! We will be treated to an outdoor breakfast buffet for $13.49 per person plus beverages, tax and tip!We will enjoy entertainment by Ted Newman who has appeared on American Bandstand and toured with Johnny Cash, Carl Perkins and played bass with John Denver! What a FUN summer morning!!! Please peruse the breakfast buffet menu in your building’s book prior to signing up! Breakfast is on your own! If you cancel within 24 hours of the event, you will be responsible for a $5 cancellation fee; $10 if it is a 2 van event. Please sign up in the Birch dining room to be a part of this event. Come on, ladies, let’s get over to Lucile’s for breakfast. Serving a Creole themed menu, Lucile’s has made its mark with such unique meals as “Cajun Breakfast” (red beans, poached eggs, hollandaise and grits) and “Eggs New Orleans” (fried eggplant, poached eggs, Creole spice and hollandaise) as well as Rice Pudding Porridge, Eggs Sardou and Shrimp & Grits. Breakfast is on your own. Please look at the menu in your building’s trip book to view the options before you sign up! If you cancel within 24 hours of the event, you will be responsible for a $5 cancellation fee; $10 if it is a 2-van event. Please sign up in the Birch dining room to be a part of this event. Rated PG-13…2017….Meryl Streep and Tom Hanks star in this historical drama when the “Washington Post” agrees to publish the leaked Pentagon Papers—which point to a secret escalation of the Vietnam War—the Nixon administration tries to block publication, setting off an epic legal and political battle. No need to sign up, just come and enjoy! Be sure to join us for this refreshing restaurant in old town Littleton! We will enjoy a very nice afternoon in old town Littleton with friends and neighbors! This friendly neighborhood restaurant boasts beautiful views of the mountains out of their top floor patio….The menu included burgers, salads, sandwich favorites and more! Please peruse the menu in your building’s book prior to signing up. Lunch is on your own. If you cancel within 24 hours of the event, you will be responsible for a $5 cancellation fee; $10 if it is a 2 van event. Please sign up in the Birch dining room to be a part of this event. Rated NR…1953 Musical….Washed-up movie star Tony Hunter (Fred Astaire) tries to revive his career on Broadway in this classic musical comedy. Hunter and his talented cohorts encounter all kinds of problems as they’re to bring “Faust” to the stage. Musical numbers include “That’s Entertainment” and “Dancing in the Dark”. Cyd Charisse, Oscar Levant, Nanette Fabray and Jack Buchanan also star in this old time favorite. No need to sign up, just come and enjoy! Don’t miss this opportunity to spend time with friends and neighbors while enjoying some treats! Come and unwind in the company of old friends and new! This is a great way to meet people in the community! Come join in the fun!! Please RSVP in your building’s book to be a part of this event by Wednesday, June 27.